Excuse me, Sir, but do you have any spare LGBT Change? One of the greatest things about the Chicago LGBT community, as we all know, is the number of take-your-shirt-off-worthy events it churns out during the summer, the last major one of which is Market Days. However, not one to fall to complacency (or the temptation to start consuming carbs, of course), the LGBT community has put out one more Summer extravaganza for all to enjoy. “Be The Change”, an event providing platform for LGBT and LGBT-friendly peeps to network, socialize, innovate and, yes, enjoy a drink or two will take place at Spin, on Saturday August 15th, from 6pm-10pm. Put together by LGBT Change and Club 1948, two non-for-profit organizations promoting tolerance, love, and acceptance across all walks of life, the event will be kicked off by live DJ K, followed by a live power-swing band performance from Ever So Klever, a free drink (need we say more? ), goodie bags (not a metaphor), nibbles (open to interpretation), but best of all–representation from additional Chicago-based non-for-profit organizations. Cover charge will be $10, and all proceeds will go to local non-for-profits. With that much energy, flare and swing, you might find yourself having too much fun to notice that your shirt is long gone. To find out what other mischief Shlomi has uncovered in Chicago, look no further. The other day I was in a particularly profound and introspective mood, which got me thinking about the truly important things in life: finding one’s true voice, figuring out the meaning of happiness, and trying to imagine what Ellen would look like if she got a red perm, or, perhaps, a short, spritely Jewfro. With each sip of my Chicagotini (vodka, crushed ice, organic snow flakes, giant ice cubes and natural hail), I could feel myself getting smarter. It was not until Andy came home, turned off the strobe lights, opened a window to let out the smoke, and demanded that I “put on some normal clothes”, that I got off cloud nine and realized that one of the most truly important things in life is finding someone who’ll take you just the way you are. And a great place to find that special someone is Flirting For Disaster at Hydrate, on Thursday, February 5th. The event benefits the American Red Cross of Greater Chicago , which has been hosting a series of the Flirting events throughout the city since 2001. Advance tickets are $20 and will buy you delicious hors d’oeuvres by HB Home Bistro and Halsted’s, performance by the beautiful divas of Kit Kat , a leather fashion show by Shel-Don, and oh yeah–a room full of potentials! All proceeds from the event will go to facilitating response to disasters in the Chicagoland area, which should be enough reason to get anyone to put on their finest, look their cutest, and start getting their flirt on. To learn more about Shlomi’s take on the greatest city in the world click here. You know, one of my recent posts prompted someone to suggest that I “find something better to do” other than “obsess about being gay“. Not one to overlook expressions of sincere concern from our readers, I decided to think of something better to do with my time. For inspiration I looked deep in the mirror to see if there was something more meaningful I could do, like a good tweeze, a shave or a pluck. But alas, perfection had already beaten me to my face. Frustrated by my fulfilled potential, I decided to pick up something to read. But flicking through the last issue of “How Big Is It?” I realized that I had already read all the ads cover to centerfold. So lastly, I popped a DVD in the player to see if any of the dialogue in “The Thai Ladyboy” would inspire me, but alas, nothing new. 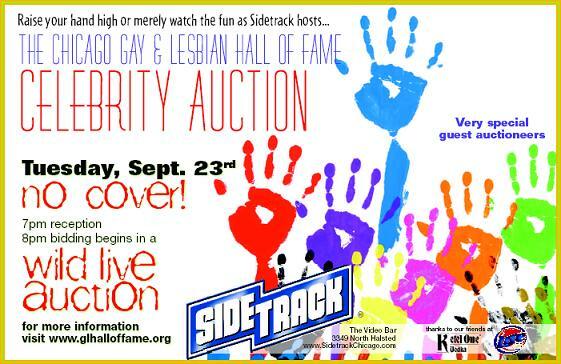 Which is fine, because a place I know where I’ll find a truly great cause is the 16th Annual Hall of Fame Celebrity Auction, to be held at Sidetrack on Tuesday, September 23rd at 7pm. The auction benefits the 2008 Chicago Gay and Lesbian Hall of Fame induction ceremony. For those of you who don’t know what that is, think of it like any regular Hall of Fame induction ceremony, only with a fog machine and strobe lights. The event is sponsored by Boi Magazine, Circuit Night Club, Firefly, J&L Catering, Ketel One Vodka, Miller Lite, Sidetrack, and supergurl images. And should this not qualify as “something better to do” with my time, perhaps I will simply go home and look for something less gay on television. Surely Bravo has a new show.